REDONDO BEACH – Power boaters, sailors and human powered vessel owners, provided remarks and recommendations on five proposed locations for Redondo Beach Harbor’s first launch ramp during an open house on Thursday, Feb. 27. 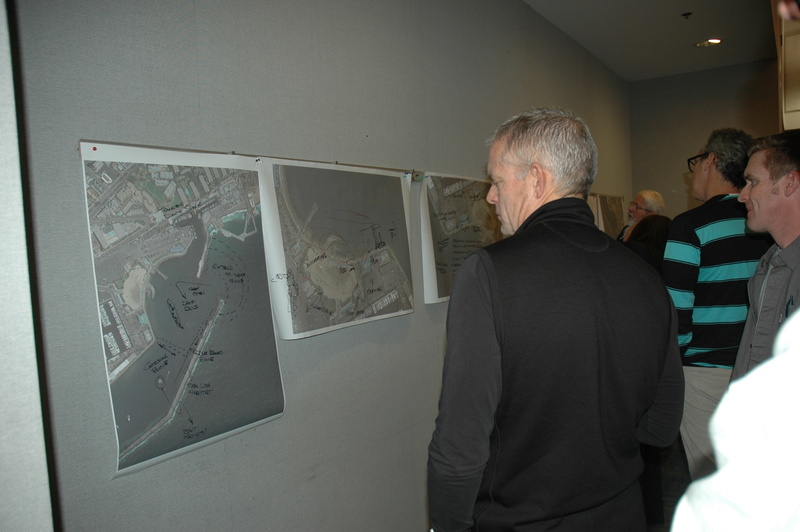 Held in the Redondo Beach Main Library, the open house was a time for stakeholders and interested groups to meet with civil engineers to discuss their thoughts on the project. Moffat & Nichol Civil Engineer Robert Sherwood and Coastal Engineer Russ Boudreau presented attendees with five alternative designs for the future boat ramp. The alternatives were modified using the feedback provided by those who attended the Feb. 6 open house. While portions of the plan, such as the removal of the harbor’s existing boat hoists and the relocation of the dinghy dock remains unchanged, there is still much to be considered. The hoist and dinghy dock will either accompany the launch tamp to Mole D or by Polly’s at the Pier. The first alternative consists of a detached breakwater that would allow paddle boarders to pass one way and power boaters another. The second alternative considered features the adaptive reuse of the rock material around the harbor to create an L shaped breakwater to protect the launch ramp. Both alternatives will require the launch ramp to sink into the landside a little bit, which eats up 10 parking spaces. The maximum amount of parking spaces that could fit on the 1.4 acre parcel is 40. For these alternatives, only one dock would run down the middle of the ramp, which would also have two 15 foot wide boat launch lanes, Sherwood noted. The third proposed alternative was preferred by the majority of the attendees. This design reversed the small hook breakwater at seaside lagoon and added a second breakwater to protect the launch ramp. “That one was preferred because the two breakwaters separated the usages between the motorized boats and sailboats from the stand up paddlers/kayakers and swimmers,” Sherwood said. The design also utilizes maximum parking spaces, uses three launch lanes between two boarding float docks and adds a third lane on Portofino Way to lessen any congestion caused at peak launch ramp hours. The last two alternatives, are very similar in that they leave the hook jetty at seaside lagoon while adding an L jetty to protect the launch ramp. Open house guests were divided into three groups, power boaters, sailors and paddlers, discussed their concerns, thoughts and recommendations to Moffat & Nichol representative. Seated at three separate tables with all five alternatives laid out before them, to the groups discussed their user specific needs and issues. Opinions were then addressed by a representative of each table to the rest of the attendees. Several power boaters were concerned with the violent side effects of potential storm surge. While power boaters also argued over the idea of minimal to maximum parking, many attendees, like Nielsen, agreed that more parking meant more opportunity for a day on the water and is worth the longer wait caused by a larger amount of users. The orientation and size of the breakwater, which will cost half of the entire launch ramp budget, is very important for the function of the ramp so it’s not impacted too much by waves, Sherwood said. There would also be a desire for the ability to rig dinghies and other small vessels to the beach, Iverson said. “People talked about the use of the beach area; there’s not a lot of space for swimming and recreational use as it is, so there’s the possibility it could be used to expand the launch ramp circulation,” said Clark Stevens, the public input meeting intermediary. Moffat & Nichol will use boater’s feedback to create a report summarizing what the public would prefer and present two or three of the alternative designs to Redondo Beach Harbor Commissioners on March 10 and the Redondo Beach City Council on March 18, Sherwood said. Following these meetings, the company will then apply for an engineering analysis grant by April 1. If everything moves as scheduled Moffat and Nichol will then apply for a building grant on April 1, 2015. Permits with the California Coastal Commission, U.S. Army Corps of Engineers, Los Angeles Regional Water Quality Control Board, California State Lands Commission, California Department of Fish and Game, the US Coast Guard and other organizations will need to be in place before the launch ramp will be opened to the public at the estimated date of Memorial Day, 2016.